My day started with something like a nervous breakdown (me: collapsing in our bathroom over wrong version of Vitamin E oil while well-meaning husband/man servant looked on bewildered), turned into a productive afternoon of boxing Christmas decor (though still not quite getting it put back into storage) & bra shopping (also part of the morning drama - nothing in the drawer matched my Dallas Cowboys underwear), and ended with friends coming over to have pizza & wine and watch the game. Life is good, if not a little schizophrenic. holy crap sounds like a bit of my family happened to you. I am so glad your day finally got its act together. 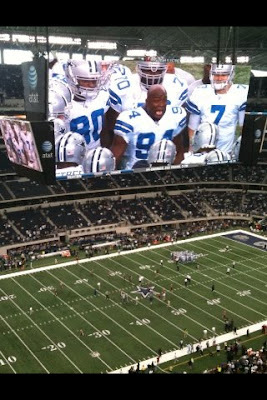 =) Though I cannot fathom love of the Cowboys, I am indeed happy if they managed to make your day better. I know there were cheers at your house last night! Congrats! Hope you can channel that winning vibe into foot wellness. Our game viewing: the husbands = native Texans and lifelong Cowboy fans; the wives = native south Jersey girls and lifelong Eagles fans. fortunately the wives of New Jersey weren't nearly as vested in the outcome. That photo cracks me up. WHile you were enjoying the cowboys game (or maybe on the flight home), I was crawling on my floor because my uterus was in trauma. But I'm glad your daily traumas turned out good in the end.